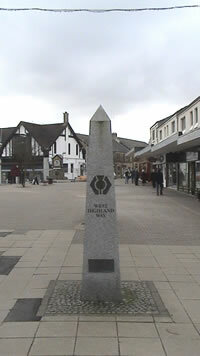 This is the obelisk in Milngavie where the West Highland Way route officially begins. Time for the photos and move on. Apart from getting a bit to eat I don’t think the Milngavie hold much for the walker of the West Highland Way. That said I know that in any long distance walk or any hill walking for that matter I am usually happy to leave civilization behind quickly. As I grew up a few miles down the road from Milngavie I had no interest to wander around it. The main place here that most hikers would have a stop to look at is the Iron Chef; this houses the West highland Way Information Centre and the bag carrying company Travel Lite. Their baggage transfer service, for the whole route is only £33, fairly cheap I thought. So anything that you have forgotten will be here. They are located about 100 meters from the start here. The first few miles out of Milngavie is easy going, on the whole the first day on the West Highland Way to Drymen is a walk in the park, several parks actually. This is the easiest of all the days along the route a good time to get the muscles used to walking all day, especially if you are carrying your own rucksack. The noise from Milngavie disappears very quickly, it is a small town. The path leads directly to the right of the obelisk above, where there are also two West Highland Way benches. Head down into a small car park, cross and follow the signs, and feel the tension of city life ease away from your body. Shortly the path turns and follows the Allander Water following the bank, then it turns again after a few hundred meters and heads uphill through the higher part of Allander park. There are some views over the edge of Glasgow from the top of this small rise. The next park is Mugdock Wood, and the way continues easy along small paths. Mugdock Castle is contained here – it has toilets, a gift shop, and a small cafe should you need it. The continues down a small road after Mugdock, then along part of the Allander Burn, then along the west shore of Craigallian Loch. From here you can now see Dumgoyne Hill at the western flank of the Campsie Hills. There is a short walk along the B821 the turning right walking along fairly flat ground passing Carbeth Loch. Turning right again off the B821, cross the road, over the stile, then walk down Tinker Loan. From here the path drops down again, with a view of Ben Lomond, that is were we will pass the next day. After the route drops down into Strathblane it is fairly flat easy farmland for the rest of the day, good views surround you however they are far out of reach. Along this part we walk an old disused railway track most of the way to Gartness. About half way between Milngavie and Gartness, just before Dumgoyne, is Glengoyne Distillery. There are tours every hour from 10am, Monday to Saturday. Worth a stop I think, and a little dram! The West Highland Way follows the road from Gartness to Drymen. 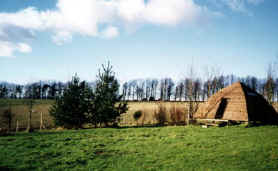 However I don’t get as far as Drymen, my first night was at the Easter Drumquhassle Farm, sharing a wigwam for the night. This is about half way between Gartness and Drymen. An easy walk to Drymen to have some food in the evening, where there are a few places to eat. Easter Drumquhassle Farm has three options for hikers on the west highland way. They have a Bed & Breakfast, Camping, and wigwams which are used as bunkhouses and sleep up to six people. This is the link http://members.aol.com/juliamacx/index.htm visit them for more information.